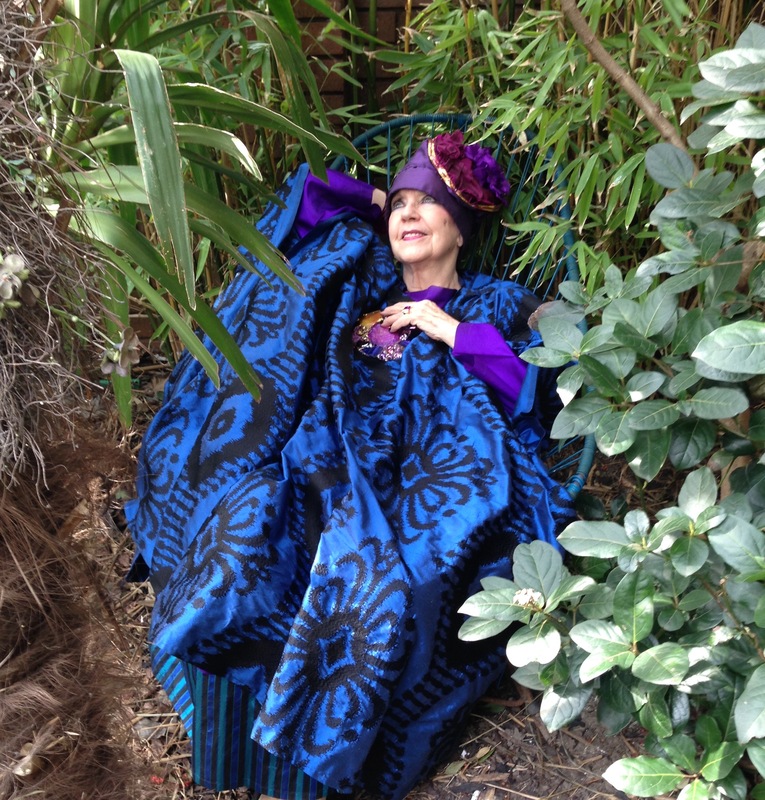 Molly Parkin, Painter and Poet, on her garden. It was her voice that rescued me when I was in the gutter. I was thin as a rake at that time and undeniably glamorous, but I was pleasuring these meat porters at 5am when the local pub was opening for them. I was still in my gold lamé. They’re simple boys those meat porters and they were lovely. I’d recommend them to anyone. I’d been out for a week and I was exhausted so I lay down in the gutter at the side of the road just for the novelty of it and thought that I was just about as low as you could go. Then my granny’s voice came to me and said, “That’s it, cariad. The party’s over. You just had your last drink.” I was so relieved. GB What had made you stop painting? MP It was after I discovered my husband was having an affair. I found his Carlton Tower hotel bill from Christmas Eve. When you have an emotional shock like that you go cold inside as if snow has started falling – and yet your wits are still about you. I called up the Carlton Tower and spoke to the concierge and they said that Mr and Mrs Parkin had spent the day together in the suite and then they’d left for Paris. At the time we lived a few doors away from the Chelsea Arts Club. I bought that house with my painting money. He came back laden with more presents than I had ever seen because they were guilt presents – including a tiny television for the kitchen, which no one had ever heard of then. But of course it was all paid for with my money. So I kicked him out. Infidels always become careless at a certain point. You have to step back and allow Fate to take over, then everything goes your way. But at the time I had all these commissions. I went to my studio on the Monday morning and it was full of huge canvasses, primed and commissioned by people who had paid in advance – and nothing came, as if I was frozen and it lasted for 25 years. That’s how I ended up in the loathsome world of fashion. At Art School, you’re told right at the start of it that if you’re going to be a painter or a sculptor, to prepare yourself to be a waitress for the rest of your life and not to plan for your art to make money for you. GB When did you first start to love gardens? MP I was introduced to gardens by my grandfather down in Wales. I used to help him in the garden from the age of four or five. He was also the man who took me to the top of the mountain. It was in a mining valley in South Wales and I suppose you could say that I’m addicted to landscapes. I am an abstract expressionist landscape painter. So from the age of five my grandfather would take me to the top and I’d say, “My little legs can’t do further, Tadci!” He’d say “Just a little bit further now. There’s a prize at the top.” I thought there was a sweetshop there so I went scrambling up and the clouds were just above us. “This is the prize that we were coming to. Look up. This is the nearest that you get to God.” I said, “Is God living up there then?” “Exactly,” he said. That’s the same mountaintop I went to for guidance when my mother was on the brink of dying. So I’ve always known, in times of trouble, to go to the top of my mountain. I tried to go back and live there when I was penniless and that’s where I became bankrupt. I knew that I needed further spiritual enlightenment and that creating more wealth wasn’t the answer. Then a friend took me to India. I’d been keeping India for the pudding stage of my life. I have a great belief in Paradise but I also believe you can create your own Paradise here on earth. GB And when did you first start to love painting? Every night when I go to bed I say goodnight to my mother and father. I’ve forgiven my father who abused me as a child because it was pointed out to me by an American film director that I’m a Painter because he took me from the earliest age and sat me at the age of five or six in front of the Constables – and the Turner one of the steam train. I’ve seen the Turner film six times now. But if my dad went to spend a penny I ran round to see naked women with fulsome bosoms and bottoms, the Ruben’s nudes. When I was a fashion editor I had to use thin models and I wanted that fulsome sort. Now I’m older. I look back with such gratitude. My grandmother lost 11 children. My mother was the only one to survive. She was a very talented musician. She was the organist in our chapel and the beauty of the valley. But she was in and out of psychiatric hospitals. A psychiatrist from America later explained that she was suffering from what my father was doing to me. He said that the wives always know. But at the time I thought it was my fault. GB And how did you end up here, with your garden? MP When I was made bankrupt I had to go to the homeless desk in Kensington and Chelsea Town Hall. There I felt real shame because there were all these refugees in the room and I was going to be taking a home from them. There is an awful ethic in this country that if a person doesn’t have money they’re treated like dirt. But I was brought up as painter to imagine I would never have money. I would never treat people differently. I was dressed like an extra in Cleopatra but they didn’t know what was withering inside me. I asked for a place in Chelsea. “Absolutely not!” said the woman behind the desk without even looking up. In the end I was offered this flat because nobody wanted to come to this estate. It was the most violent one in London. Christine Keeler was put here when she was homeless. When they made the film, Scandal, she got some money and moved away from here. It was rife with drug addicts and within a month of me moving here there was a murder of a fourteen-year-old boy in the front there. All the flowers were around. It was perpetrated by a gang member, because he’d been bullying kids for money for drugs. So they killed him with a revolver and they still haven’t found out who did it because they stick together. I looked back to where my happiest times had been all through my life – when I bought the house in India I had coconut trees. It was a big house at the bottom of the Holy Mountain and people would come from all over the world for the Guru’s teachings. My garden there was unbelievable. I bought many more trees and shrubs so I already knew how to make a garden. I had 35 monkeys in that garden. I went there for 12 years and received the lessons I was meant to from the ashram. Many birds came to that garden. One was a nightingale. The sounds of music from nature are unbelievable. GB What was the inspiration for your garden here? MP When they gave me this ground floor flat it was in the Senior Citizens corridor for the elderly and infirm and it was so frightening with this space outside because everybody could look in. Nobody goes out on their balconies here. They’re refugees and they’re frightened. I thought I’d do what I did in India and planted trees here. One day a leaflet was pushed through my door about a voyage to the Arctic. I love anything to do with water and icebergs and all that so I thought I could paint it. I suggested to the Sunday Telegraph that they send me, as I could illustrate my own article and they jumped at the chance. I was worried about who would water the garden but then I realised that trees don’t need watering so I could have an evergreen garden that would prosper while I travelled. They were only so high and now it’s like Epping Forest! I’ve been here thirteen years now. At times of loss I’ve sat in the garden and it’s where I realised that my painting muse is back for good. So these trees have given me privacy here and enabled me to live on a Council Estate that was dangerous when I came here but is no longer. MP Beauty, whether an object or a landscape or a poem , palpably moves you. You’re moved by it. Something shifts around the heart. This is a poem that describes the immense importance of it. It’s called The Bright Field and it’s by the celebrated Welsh poet, RS Thomas.